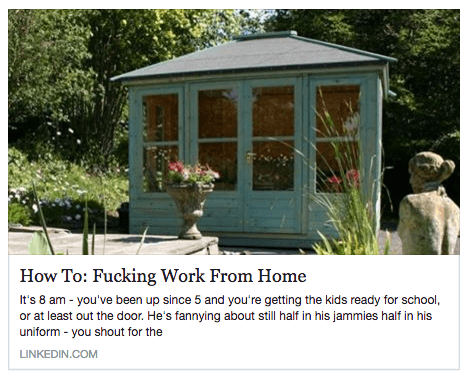 A Scottish mum has been banned from LinkedIn after posting an emotional article on the platform about the struggles faced by parents who work from home. The article struck a chord with many parents, perfectly capturing in word the daily tensions many of us feel when trying to balance our home, family and work lives. And while the Internet was divided on the use of the f-word in the headline, most readers took the post — a relatable story of a working parent trying to navigate their way through a daily routine and looking for a place of respite — in the honest spirit it was intended. “I had written ‘how to work from home’ as my subject title, then said ‘no, it’s how to f*****g work from home’, because it can be such a nightmare. I was trying to get emotion across,” explained Cara. The controversial post had brought about a spike in orders worth an estimated £100,000 to the business, which Cara says she now stands to lose if LinkedIn doesn’t return access to the account. Despite holding a premium account with the network, Cara has not received an explanation for the ban, but believes it was taken offline for one simple reason: “probably something to do with me saying f*****g”! Those wishing to pledge support for Cara’s freedom of expression on LinkedIn are encouraged to use the hashtag #swearygate on social media. Institute of Mums has contacted LinkedIn for comment.